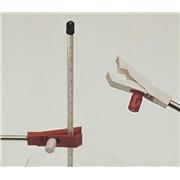 Thermometer Clamp, Synthware, Extension Rod Diameter: 10mm, Overall length: 200mm. Like 2824B33 except with 12.5 mm extension rod. 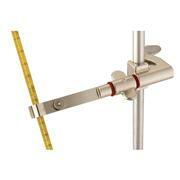 Holds 6 to 13 mm diamter objects up to 18 cm form support rod. 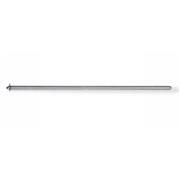 Overall length is 21 cm. Requires clamp holder for attachment. 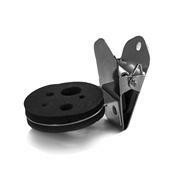 Self tapping screw clamp secures small object to wall when no frames are available. 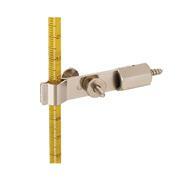 58 mm long with jaws adjustable from 5 to 10 mm. 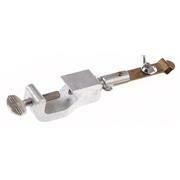 Wing nut clamp holds thermometer or other small glass apparatus. 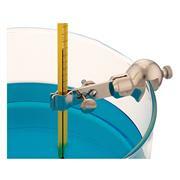 Suspends 6 to 13 mm thermometers over water bath. 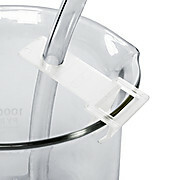 C clamp holder fits bath walls up to 9 mm thick. 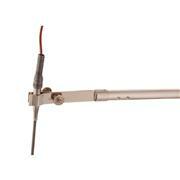 Overall length is 64 mm. 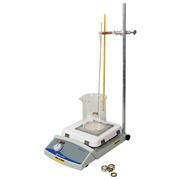 …apparatus used for single determinations, asphalts, pitches, tars and most resins. 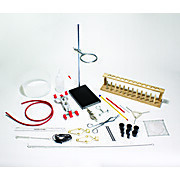 Includes burner, beaker, support stand, 1 ring, wire gauze with ceramic center, thermometer clamp, 1 shouldered ring and stem with hardened steel ball. 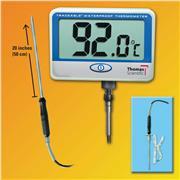 Order Thermometer separately. 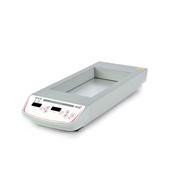 Meets ASTM D36, E28; AASHTO T53. 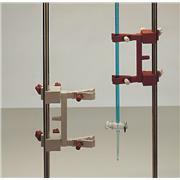 …ball method softening point apparatus used for single determinations, asphalts, pitches, tars and most resins. 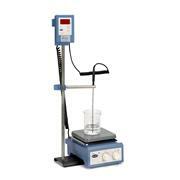 Includes hotplate, beaker, support stand, 1 ring, wire gauze with ceramic center, thermometer clamp, 1 shouldered ring and stem with hardened steel ball. 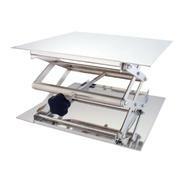 Meets ASTM D36, E28; AASHTO T53. 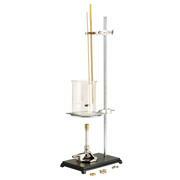 Conical 4" neck with three socket joints in line, plus a 14/35 outer joint for thermometer. 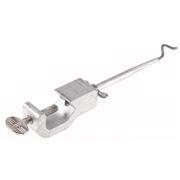 Use 6496 Clamp for securing to flasks. 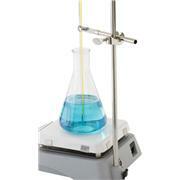 For use with 6475, 6476, 6477, 6479, 6480, 6481, 6491, 6492, 6497, 6498 and 9656 ACE Reaction Flasks. 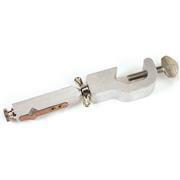 Flat ground flange for use with all Reaction Flasks that have a 100mm (4") Duran ground mating flange. 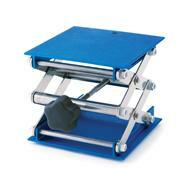 Supplied with three in line ground joints and one or two 90 degree joints. 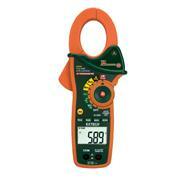 For thermometer or probe adapter, see our 5028 series. 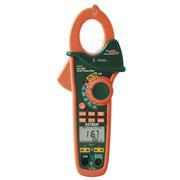 For clamp, see 6517. Flat ground flange for use with all Reaction Flasks that have a 150mm (6") Duran ground mating flange. 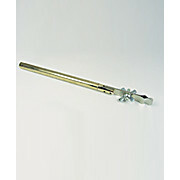 Supplied with three in line ground joints and one or two 90 degree joints. 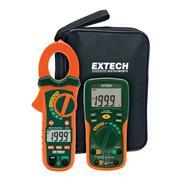 For thermometer or probe adapter, see our 5028 series. For clamp, see 6517.